Does my PADI-endorsed insurance cover me if I am teaching or supervising technical diving activities? If you select the Tec Rec endorsement and submit technical credentials, the endorsement covers you for your technical activities in accordance with the Terms and Conditions of the TecRec Endorsement. Does my PADI-endorsed insurance cover me if I am teaching students through another certifying agency? Yes, and there’s no need to list the other certifying agency for this coverage to be in place. Your policy covers you for your activities while supervising and training divers in accordance with the Terms and Conditions of the policy, regardless of the certifying agency through which you are training your students. And, since the certifying agency has its own policy to provide coverage for its activities – setting the standards, developing educational materials, etc. – there’s no need to list the certifying agency as an additional insured. However, PADI does not sanction the activities of the instructor who accepts the Universal Referral completion form and issues a certification (through any certification organization) for students whom he has not personally conducted the open water training dives. NOTE: If conducting training through another agency, you must have students sign a liability release developed or approved by that agency. 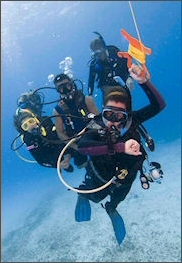 If conducting open water introductory experience programs, the programs must be conducted in accordance with Recreational Scuba Training Council (RSTC) standards. Does my PADI-endorsed insurance cover me while conducting referral dives? Yes. There is no exclusion for conducting the open water training dives for a student diver who has completed academic and confined water training with another instructor or certification agency. I won’t be teaching again until after the first of the year, why must I renew my insurance? By not renewing, you will have a gap or lapse in your insurance and will not have coverage for any "prior acts". This means if a student makes a claim against you for a wrongful act that occurred prior to your gap or lapse in coverage, then you would not be covered for this student's claim. This would be a "prior act". In addition, the insurance you are purchasing is a "claims made" policy, requiring you to have insurance at the time of the claim. For example, you certified a student in 2004 and your insurance expired in June 2005. You obtain insurance again in January 2006, however, your student has an incident in October 2005 and files a claim against you. You will not have coverage for this claim because you did not have insurance at the time of the incident and since you had a "gap" in coverage, you will not be covered for any acts prior to January 2006. It is important to maintain continuous coverage even if you won't be actively teaching for a while. We strongly recommend you purchase the non-teaching or retired protection. As a Divemaster assisting an insured instructor with classes, am I covered under the instructor’s professional liability policy? No. Divemasters, assistant instructors, instructors and retired instructors may not be Additional Insureds on the instructor’s policy, but must obtain their own insurance policy. Divemasters in training are covered under an insured instructor’s policy. Divemasters, Assistant Instructors and Instructors may be covered under a dive store/resort’s Instructional Policy purchased by the store/resort. In this instance, the individuals are insured for store-sponsored events only. Am I covered for teaching Emergency First Response (EFR)? PADI-endorsed insurance covers you for (1) teaching and supervising PADI-sanctioned courses and activities and (2) teaching and supervising divers under the standards of other recognized dive training organizations (see the second question, above). Although insurance is not specifically required for the teaching of CPR and other such courses, since EFR courses are sanctioned by PADI, they are covered, subject to the terms and conditions of the policy. Regarding the equipment liability coverage, can I rent the equipment to other instructors? Is there coverage for theft? The equipment liability coverage applies to personally owned equipment and only while used in the instructor’s own classes. There is no coverage for theft or physical loss or damage of equipment under this policy. You can also purchase liability coverage for equipment used when supervising certified divers. If I apply on the website or fax my application, do I need to mail the original as well? No. Please do not mail a duplicate application. When duplicate applications are received it is possible that the credit card will be charged again when the second application is received. How do I know when my coverage is effective? Your policy is effective on the date your completed application and correct premium payment is received by Vicencia & Buckley and approved by the insurance company. A Certificate of Insurance will then be issued and emailed to you. PADI is automatically notified that you have purchased insurance. Can I upgrade my status during the policy period? Yes. If you purchase Divemaster insurance and subsequently become an instructor, or you purchased the Supervisory or Retired insurance and want to begin teaching again, you can upgrade by paying the difference in premium. Is there a refund if I decide to cancel my policy? No. The premium for professional liability insurance is fully earned when you purchase the coverage. This means there is no refund. We recommend you keep your policy in force, even if you stop teaching, so that you are protected if a claim is made after you stop teaching. Who qualifies for Reduced Rates as an International Instructor? An international instructor is a non-U.S. citizen who teaches exclusively non-U.S. citizens outside the U.S., its territories, and possessions. This coverage is not available in the U.S., its territories and possesssions, Canada, the Caribbean, Japan or Australia. Instructors teaching in these areas must pay the regular instructor rate. My application was returned to me. Am I still covered? • Premium payment is incorrect or insufficient. • Application is not signed & dated on both pages. • The application is not legible. • PADI membership is not current. Am I covered for teaching SNUBA? The PADI endorsed Professional Liability policy does not cover SNUBA or other surfaced supplied air products unless these Introductory Programs comply with The Recreational SCUBA Training Council (RSTC) Standards. Am I covered for re-breathers? Your policy covers semi-closed re-breathers and closed-circuit re-breathers, subject to the terms and conditions of the TecRec Endorsement. You must have a technical certification. Can I submit my renewal application if I have had a lapse in coverage? No. The renewal application is designed for those members who have not had a lapse in their policy. You must fill out an application as a new insured. I only need the insurance for a month, is that possible? No. There is a set policy period of June 30th to June 30th the following year. During this period the premiums are pro-rated on a monthly basis. Additional insureds are third parties who have some type of business relationship with you, such as a dive center or hotel. They require to be an additional insured on your policy so they are protected for your negligence.